Heat up water to 8mins / 50oC / Speed 2. Insert simmering basket. Season Salmon with salt and pepper. Add to the Sous Vide pouch. Add 10g butter and fresh thyme. Put into the pouch and seal. Sous Vide for 40mins / 50oC / Speed 3. Place shallots into mixing bowl and chop 5 sec / Speed 5. Scrape down sides of mixing bowl with spatula. Add butter in a TM bowl and saute 2 mins / 120oC / Speed 1. Add 30g button mushrooms, wine, cream and cream cheese and cook 5 mins / 90oC / Speed 2. Add remaining 30g button mushrooms, pinch of grated lemon zest, nutmeg, salt and pepper and cook 5 mins / 90oC / Speed 1. 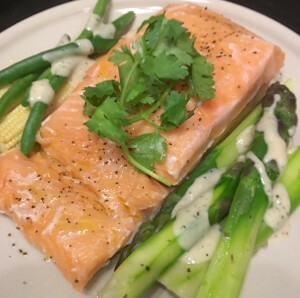 Plate the salmon with the sauce and some varoma steamed vegetables. Serve hot.